Our Wall planner 2019 with logo from Calendar Lady Promotions will help you to keep appointments, keep your eye on who's on holiday that week and lots more things that you would normally forget. Each Wall planner 2019 comes with your company details and logo printed on. So whoevers office it's hanging in, it will advertise your business details and logo. So advertise your details on our Wall planner 2019 with logo today! 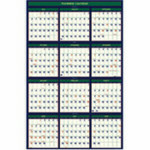 Other calendars besides Wall planner 2019 with logo click here. Other promotional and personalised items besides our Wall planner 2019 with logo click here. To find out more about our Wall planner 2019 with logo click here and fill in the contact form and we'll get straight back to you.